So the news comes from South Africa stating that Samsung has revealed two low-end Android Phones with Jellybean on it and they are named as Samsung Pocket Neo and Samsung Galaxy Star. A good thing about these phones is that being the Dual-SIM they do not use the feature of Stand-by for switching the SIM rather they use the feature of ‘Always On’ wherein call on one SIM will be diverted to other which is currently on call. 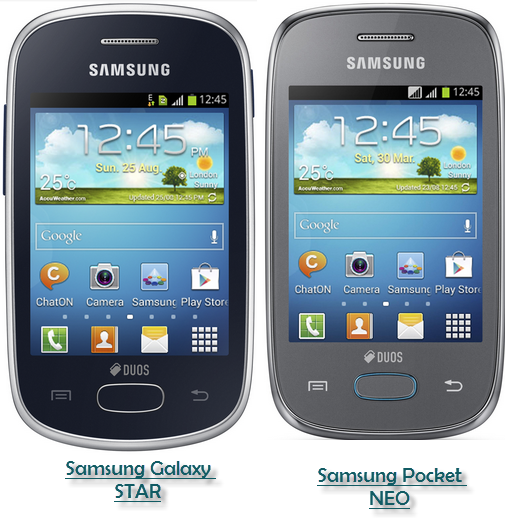 Samsung Galaxy Star has been released in 2 formats one of them is Single SIM and other one as described is the Dual SIM phone. So, after unveiling the almighty Samsung Galaxy S4 they have thought of the majority of users in Asia who might not bother to spend a big amount on a smartphone. The price and availability has not been mentioned by Samsung but as per the specifications where they are using 3 inches of QVGA screen with Capacitive Touch and 2 MP of primary camera (no support for the secondary or no video calling), you can conclude that they will fall in line with the Galaxy Y phone (which is nearly 6,500 INR). The operating system running on both the phones is Android 4.1 Jellybean and in most of the hardware parameters they resemble each other. Well as the name goes pocket is highly curved from the edges giving it a pebble type shape and the same goes with its sibling Galaxy Star. 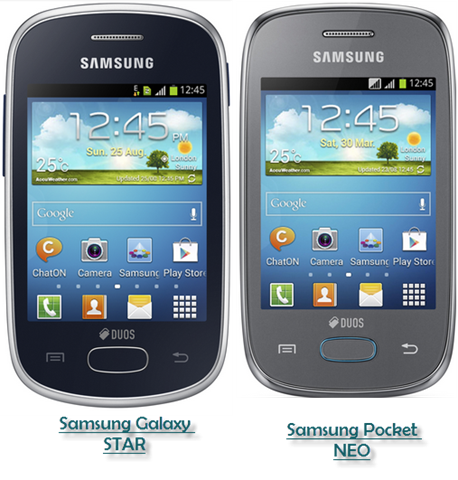 Samsung Galaxy Star carries the processor of 1GHz whereas Pocket neo has the processor clocked at 850mHz. Star series of phone by Samsung usually cover the phones which are low in specs and same goes for the pocket series also. We will tell you the detailed info about the hardware parameters in our quick review section.